​If you're like most business owners, you ​want a Turnkey System for keeping your ​blog, your social media, and your Search Engine Optimization systems running around-the-clock. And of course, you want your blog, your social media, and your SEO to actually deliver results! Not just fancy reports with graphs and widgets and blah-blah-blah. You want more traffic. You want more leads. And you want more sales -- every single day! Take a look at the "Average Salary" graphic​. 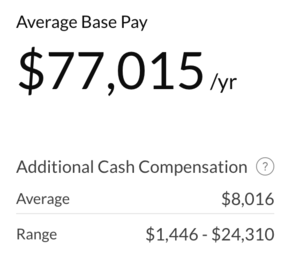 This is sourced from GlassDoor.com which compiles average US salaries data. At $77,015 per year, you're looking at more than $6,000 per month! Even an entry-level full time employee is going to expect at least $40k/year. Now you're looking at over $3,000 per month -- and that's for limited experience and knowledge. $3,000 to $6,000 per month is simply not feasible for most small businesses! ​Finally, An SEO Program That Actually Works! We put content first in our SEO approach. ​Social Media ​does affect your SEO. We include "Social Media Boosts" with your SEO plan to ensure you enjoy the added benefits of social media exposure. ​SEO success is ​only as good as your business success​. We take the time to incorporate your business goals into your SEO program for maximum impact. ​We know great SEO relies on a great website. That's why we include ​some additional website services like backups, security, and uptime monitoring​. ​​You'll receive a monthly ​report that's easy to read & easy to understand. We also offer custom reporting solutions to make everything completely transparent. No ​​contracts.​ No funny business. ​Need A Custom SEO Service? ​If you're looking for something more custom-tailored to fit your exact business needs, we're happy to help! Just click the button below to submit your request. Our team will be in touch shortly to help build a custom plan just for you.